The 15 Best Picnic Spots in Wisconsin! There are tons of cozy spaces set aside for the perfect picnic day in our great state of Wisconsin. These picturesque picnic spots overlook some of Wisconsin’s most beautiful sceneries. Grab a basket, some food, and a glass of wine and get ready for a perfect day of picnicking. Yahara Place Park located on the east side of Madison is a frequent stop for picnickers. Play lawn games, watch the sunset that over Lake Monona and the Yahara River. There is six acres worth of area for you to choose a remote spot for picnic date. Located right off of beautiful Lake Michigan—Lake Park is the perfect place to plan a picnic in the Milwaukee area. Paved walk ways, benches, and plenty of trees call for a comfortable and relaxing day. There is so much nature to discover at Lake Park. Pick a spot anywhere directly off Lake Shore Path to stop for a picnic. The views of Lake Mendota will not disappoint your company. There is so much history behind the Lake Shore Path, read up on the past and surprise your date with a couple of fun facts about the area. Snap a few pictures of you and yours at the Buena Vista Overlook and find a breathtaking view of the Mississippi River, but make sure to mark your territory quickly. Views like this aren’t a well-kept secret in the area because it has the largest balcony-like overlook of the river. The Henry Vilas Zoo is a free zoo located in Madison, Wisconsin. While this might not be a remote picnicking spot—it yields great views. Pick a spot near your favorite animal enclosure or choose from their picnic tables. There are tons of events that are hosted at Henry Vilas including movie nights—perfect for a date night. Hike to your picnicking destination or use one of their convenient picnic tables. From the rock formations, to the breath-taking views of Devil’s Lake itself. You won’t be disappointed by making the trip to Baraboo, Wisconsin. Frog Bay Tribal National Park is a newly added park to the Wisconsin park system. Surprise your date with views of the Lake Superior shoreline at your picnic spot. You’ll find convenient signs guiding you throughout the park and cool bridges to make your trip together a little more interesting. Join in the fun at Wingra Park for both intimate and group setting. The park is located on Lake Wingra with tons of activities available. Wrap up your beautiful picnic by renting a canoe or boat on site. If you bring your kids, there’s a playground to keep everyone happy. 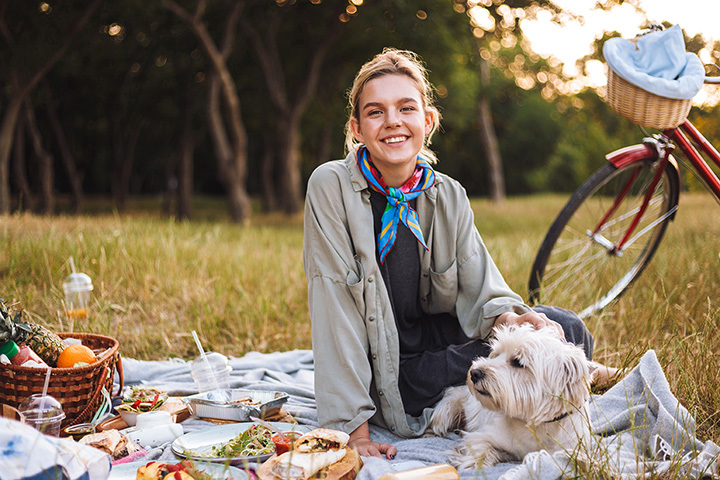 Get connected with nature by planning your picnic at the Schlitz Audubon Nature Center in Milwaukee, Wisconsin. There is a small fee to pay but your night will be worth it. The nature center is located on Lake Michigan, has nearly six miles of hiking trails, and an observation tower to see the entire lay of the land. It’s a perfect way to spend the day together. Paoli Mill Terrace and Park is an adorable private area located only nine miles from Madison. There are plenty of picnicking areas to choose. Located right off of the Sugar River and next to beautiful stone mill building calls for both beautiful architecture and nature. Humboldt Park houses so many different activities throughout the year. Picnicking happens to be a fan favorite in the warmer months. Escape the urban areas of Milwaukee by plopping down for a romantic picnic overlooking the pond and 70-acre nature filled park. Cascade Falls is a hidden gem located in Osceola. The small waterfall is the perfect spot to take your picnic date. Out of sight and out of mind calls for a peaceful and romantic date together. After taking in the views travel a couple miles down the road and check out the charming downtown. The best views at the end of the day can be found at Sunset Beach Park—so why not set up camp for your picnic? Pets are more than welcome to join you on your beachy date. While you’re at it, take a walk around the trails to catch the absolute best possible view of the sunset—you won’t want to miss it. Walk the plank over the Peshtigo River to find your perfect picnicking spot. You might even see other picnickers since the area is hot commodity in the Marinette and surrounding areas. See what all the fuss is about when you’re in northern Wisconsin. Tourist town, Rhinelander, brings in a ton of people throughout the year. The park overlooks Boom Lake and offers a public pier to unwind after a long day. While Hodag Park is a perfect pinning spot for visiting tourists, the locals love the serenity of the park too.